Chinese fashion designer Guo Pei is known for creating one of the most memorable Met Gala dresses of all time: the imperial yellow gown with a fur-trimmed cape and embroidered train worn by Rihanna in 2015. 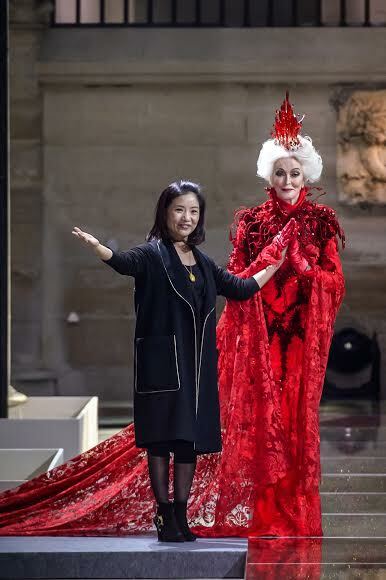 Fast-forward two years, and if you’re like many Westerners, you might not recognize Guo Pei by name. But with a new Rizzoli book, secret project with Apple, and her first American show, debuting this September at the Savanah School of Art and Design, all of that is about to change. Rihanna, told Vanity Fair on the 2015 Met Gala red carpet how she picked her gown, searching on the internet, “It’s handmade by one Chinese woman and it took her two years to make.” This was a major moment for Pei, who was one of the few Chinese couture designers worn by the celebrities, and fashion insiders who attended the 2015 Met Gala, where the Costume Institute’s exhibit was called “China: Through the Looking Glass.” Pei had two pieces featured in the exhibition. But it was Rihanna in the yellow gown that got Pei noticed. In China, Pei, a Beijing-born designer, and graduate of Beijing Second Light Industry School, is best known for designing haute couture for celebrities, creating ceremonial garments used in the 2008 Beijing Olympics, and designing dresses for the popular annual televised event, celebrating Chunwan, Chinese New Year. In 2016, Pei was invited to be a part of the Chambre Syndicale de la Haute Couture. She is the second Asian designer, following Elie Saab, to be honored by the exclusive French collective that celebrates haute couture. Zhou’s quote reflects Pei’s understanding of China’s “splendor,” a way that’s being celebrated in luxury fashion like never before. Looking at the detailed artistry of her designs, it’s apparent that the designer takes luxury to fantastical aesthetic realms. From collaborating with Carmen Dell’Orefice, the fashion industry’s “oldest working model,” who closed out Pei’s 2017 Paris haute couture show, to Bad Girl RiRi, Pei has tapped into Western pop-culture sensibility. This fall marks Pei’s first American show, at SCAD, as the university’s president, Paula Wallace contacted Pei for a special exhibition. Rizzoli is launching a book to accompany the show, with Wallace penning the foreword. Two grand openings in the U.S. are scheduled for 2017, but due to confidentiality clauses, no further information is available at this time. It’s safe to say, however, that the West has only begun to see the artistry this designer has to offer the world of fashion.